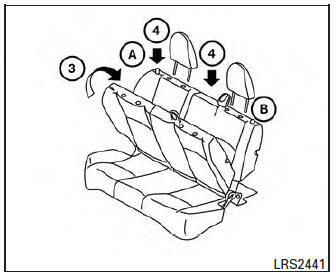 Ensure the rear outboard seat belt webbing is properly stowed in the clip which is located at inside trim 1 before moving the rear seatback 2 in order to prevent the outboard seat belt from getting caught behind the rear seatback. 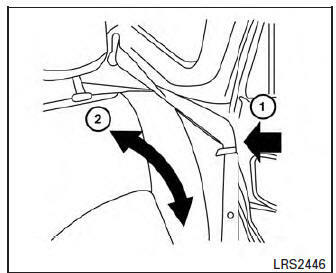 Remove head restraint/headrest from the rear seatback. Pull the strap A to fold each seatback down. 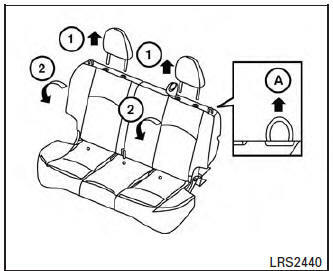 To return the rear seat to a seating position, lift up on the seatback and push it up to an upright position. Firmly press zones A and B to lock the seatback in place. Never allow anyone to ride in the cargo area or on the rear seat when it is in the fold-down position. Use of these areas by passengers without proper restraints could result in serious injury or death in an accident or sudden stop. When returning the seatbacks to the upright position, be certain they are completely secured in the latched position. Closely supervise children when they are around cars to prevent them from playing and becoming locked in the hatch where they could be seriously injured.